Every nine seconds in the United States, someone suffers a brain injury. These injuries can result from any number of unpredictable situations. The effects of these brain injuries can be just as unpredictable. In a matter of mere moments, a person’s life can change forever. In recognition of Brain Injury Awareness Month, which takes place in March, we are shining a light on acquired brain injury (ABI). An ABI is an injury to the brain that alters the brain’s nerve cells. There are two types of ABI: traumatic and non-traumatic. A traumatic brain injury (TBI) is defined as a disruption in the normal function of the brain, caused by an external force. Some common causes of TBI include falls, assaults, motor vehicle accidents, physical abuse, gunshot wounds, and sports or recreation injuries. A non-traumatic brain injury is a change in brain function or pathology caused by an internal force such as a stroke, seizure, tumor, drug overdose, or metabolic disorder. The damaging effects of a brain injury begin immediately. Brain tissue reacts to the trauma with a series of biochemical and other physiological responses, destroying brain cells in what is called secondary cell death. A brain injury may affect physical, cognitive, behavioral, or communication skills. Brain injury severity is often categorized as mild, moderate, or severe. The severity of damage to the brain is one of the primary factors in determining the long-term impact of the injury on an individual’s functioning and level of independence. A brain injury can cause long-term problems with movement, communication, memory, vision, thinking, or reasoning skills. Emotional and personality changes may interfere with the patient’s ability to successfully interact with others. Specialized brain injury rehabilitation programs are designed to direct and maximize the patent’s recovery and overall functional outcome. Sunnyview Rehabilitation Hospital, an affiliate of St. Peter’s Health Partners, offers specialized care for individuals with brain injury and their families. As a Brain Injury Center of Excellence, Sunnyview offers a comprehensive continuum of care through the inpatient acute rehabilitation program, outpatient neurological center, concussion management program, driving center, as well as assistance with a patient’s return to school or return to work. Sunnyview is fortunate to offer some of the most advanced technology to help patients regain their mobility following a brain injury. Resources and high-tech tools include the LiteGait System, Therastride Locomotor Training System, RT300 Leg and Arm Functional Electrical Stimulation Therapy System, Xcite Functional Electrical Stimulation Therapy System, InMotion Arm Robot, and the Re-Walk and EksoGT robotic exoskeletons. As a Specialized Brain Injury Rehabilitation Program accredited by the Commission on Accreditation of Rehabilitation Facilities, Sunnyview is committed to developing and implementing research studies that will advance the field of brain injury rehabilitation. 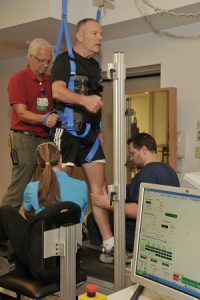 The center is currently leading a brain injury research study to evaluate the use of the Therastride Locomotor Training System in improving walking function. We are recruiting participants for the study. Interested participants must be 18 years or older and have experienced a traumatic or non-traumatic brain injury, at least 12 months post-brain injury, and cleared as safe to participate by their doctor. To learn more about the study, including other requirements for participating, please contact Patti Valenza at 518-386-3585 or visit the Sunnyview Brain Injury Center of Excellence webpage at http://www.sphp.com/brain-injury-svh.